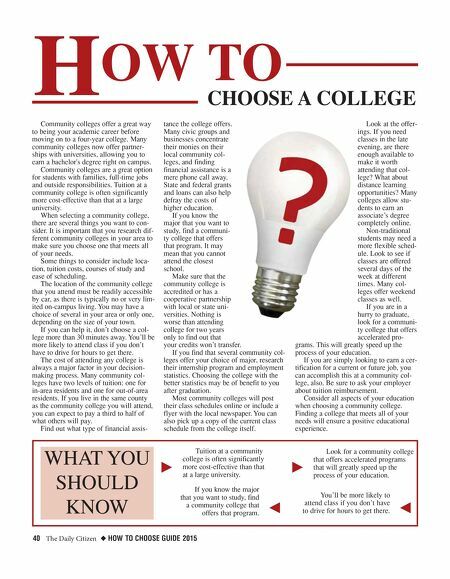 40 The Daily Citizen ◆ HOW TO CHOOSE GUIDE 2015 Community colleges offer a great way to being your academic career before moving on to a four-year college. Many community colleges now offer partner- ships with universities, allowing you to earn a bachelor's degree right on campus. Community colleges are a great option for students with families, full-time jobs and outside responsibilities. Tuition at a community college is often significantly more cost-effective than that at a large university. When selecting a community college, there are several things you want to con- sider. It is important that you research dif- ferent community colleges in your area to make sure you choose one that meets all of your needs. Some things to consider include loca- tion, tuition costs, courses of study and ease of scheduling. The location of the community college that you attend must be readily accessible by car, as there is typically no or very lim- ited on-campus living. You may have a choice of several in your area or only one, depending on the size of your town. If you can help it, don't choose a col- lege more than 30 minutes away. You'll be more likely to attend class if you don't have to drive for hours to get there. The cost of attending any college is always a major factor in your decision- making process. Many community col- leges have two levels of tuition: one for in-area residents and one for out-of-area residents. If you live in the same county as the community college you will attend, you can expect to pay a third to half of what others will pay. Find out what type of financial assis- tance the college offers. Many civic groups and businesses concentrate their monies on their local community col- leges, and finding financial assistance is a mere phone call away. State and federal grants and loans can also help defray the costs of higher education. 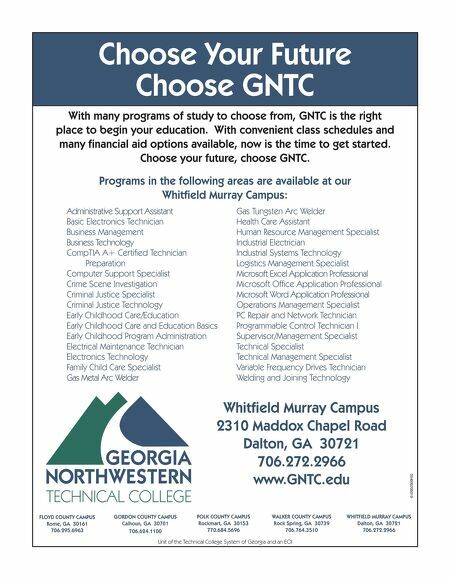 If you know the major that you want to study, find a communi- ty college that offers that program. It may mean that you cannot attend the closest school. Make sure that the community college is accredited or has a cooperative partnership with local or state uni- versities. Nothing is worse than attending college for two years only to find out that your credits won't transfer. If you find that several community col- leges offer your choice of major, research their internship program and employment statistics. Choosing the college with the better statistics may be of benefit to you after graduation. Most community colleges will post their class schedules online or include a flyer with the local newspaper. You can also pick up a copy of the current class schedule from the college itself. Look at the offer- ings. If you need classes in the late evening, are there enough available to make it worth attending that col- lege? What about distance learning opportunities? Many colleges allow stu- dents to earn an associate's degree completely online. Non-traditional students may need a more flexible sched- ule. Look to see if classes are offered several days of the week at different times. Many col- leges offer weekend classes as well. If you are in a hurry to graduate, look for a communi- ty college that offers accelerated pro- grams. This will greatly speed up the process of your education. If you are simply looking to earn a cer- tification for a current or future job, you can accomplish this at a community col- lege, also. Be sure to ask your employer about tuition reimbursement. Consider all aspects of your education when choosing a community college. Finding a college that meets all of your needs will ensure a positive educational experience. H OW TO CHOOSE A COLLEGE WHAT YOU SHOULD KNOW k j Tuition at a community college is often significantly more cost-effective than that at a large university. If you know the major that you want to study, find a community college that offers that program. k j Look for a community college that offers accelerated programs that will greatly speed up the process of your education. You'll be more likely to attend class if you don't have to drive for hours to get there.